I didn't see the first Gangers confidential in the end. Quite sad about that really, I tend to enjoy the confidentals. Anyone mind telling me if anything interesting happened in it? I could upload it for you but not sure if iplayer files can be uploaded? Oh and theory! Not sure if been said before but in the Big Bang, there was lots of things that didn't make sense. One of these was when the Doctor didn't exist, how come Earth wasn't destroyed by all the aliens that attacked it before since the Doctor protects it? In 'A good man goes to war' Kovarian says they go to war against him and River says that he caused them to attack him out of fear. So what if they only attacked Earth out of fear of the Doctor. His home planet is destroyed so they attack Earth because of him liking it. When the Doctor didn't exist, no fear of him so Earth wasn't attacked, hence normal Earth in The Big Bang. If you use your phone as an alarm, and can set the alarm tone, I could send you the mp3 I'm using. PM me your email address then. Not quite, the Time Lords sent him to Skaro to destroy the Daleks before they were created, but the Doctor didnt like the idea of slaughter so just sabotaged the experiments which set them back about a thousand years. The Daleks have always had a bit of a floating continuity since in their first story there was onlya few of them and they needed radiation to survive and could only move on magnetic floors. I guess I missed the memo, but why do we have to wait until September for the rest of the series? Pulling in/retaining more viewers I think, give 'em a massive cliffhanger and make them wait. Means people don't dip out halfway through the series. Thanks for that. I haven't watched many old Who. I knew he got sent back in Genesis of the Daleks, but couldnt remember what quite happened. Also, words can't describe my happiness when I found out that Arthur Darvills mum was Whybird from Playdays (or rather, the voice of Whybird). Whybird was amazing. I reckon it had more to do with Arthur Darvill with no shirt on for a significant period of that episode. His acting is better than his chest (not that it's hard). True, true, but I know people who would disagree (my friend is obsessed, it's hilarious). I love Rory. And the Doctor, of course. Does not count iPlayer ratings. Solid ratings. Curiously the weakest episode critically had a higher number of viewers than the mid-series finale. It had pirates in so people were going to watch it regardless tbh. 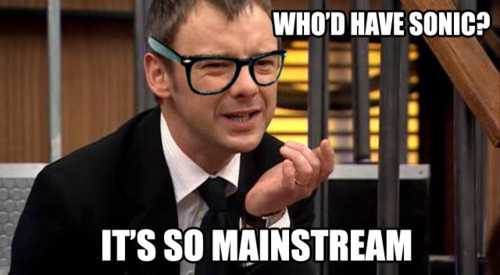 Nooo, don't make the Master into a hipster-tard :'( I see the kind of douchebags who wear those kind of glasses, with their skinny purple jeans, on a weekly basis.